Lucky Ox Dung in Ox Year! If KFC's Colonel Harland Sanders meets a Chinese lady competitor? Real "Kung Fu Panda" ! English Brain Buster: Can you understand these signs? All Newspapers, the Same Face. Cool City Street Cleaning Machine. 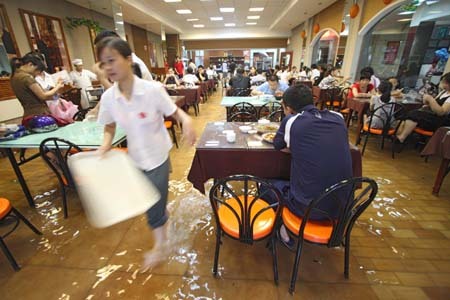 A restaurant in Southern China was in flood after a heavy rain, customers ate like nothing happened.